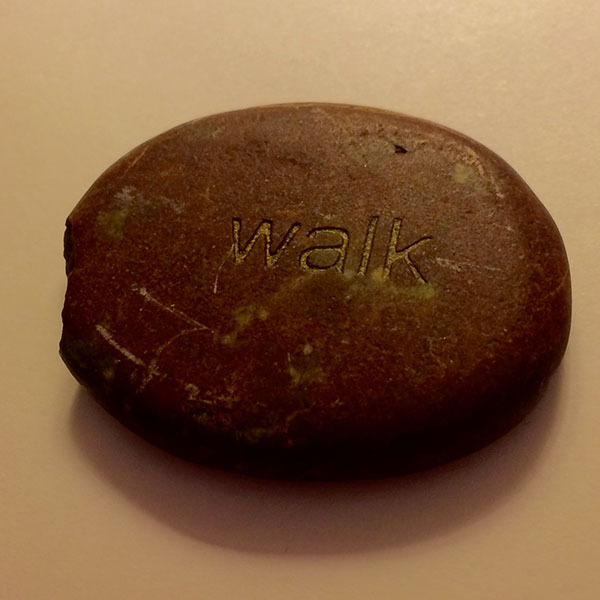 When we were on vacation, the little camp store at our timeshare was selling these silly mantra rocks. I had been wanting a worry stone anyway and intended to get one. But when the next trip to the store arose, I was too embroiled in my book and too lazy to get up and go along, so I told my husband to pick one for me, and let our kid pick one for himself. The kid got one that said “Relax.” Fitting, in that he gets all spun up very quickly on fairly minor things. Funny, because we were on vacation and so relaxed at that moment in time as to be comatose. The rock above is what was brought home to me. Anyone who knows me knows that exercise and I are not particularly well acquainted these days. So this was a cheerful tongue-in-cheek motivator to get off my duff and move. It made me laugh. I dropped the thing in a parking lot shortly after getting it; that’s why the left side is all jagged like that. But that’s been good, too. I keep rubbing the rough edge, intending that in another 35 years or so it will be smoothed down (unless I drop it again, natch). I find this fitting. Walking is a slow, steady process that leads one to a destination. Rubbing off a rough edge is a similarly slow, steady process — be it a rock or a personality. But, you know, it still requires getting off one’s duff and moving. I love wordplay like this. Anyone who has a twofold word they turn to in this manner should please say so in the comments!